UNIVERSAL Coin Ring Starting, Finishing, and Polishing Kit! At CoinRingUSA®, we uphold the highest standards by sourcing only the best quality material and highly skilled craftsmanship when making our coin ring tools. This Kit comes with the newly-improved universal stainless steel starter cone that’s used to begin folding coin rings to lessen the wear and tear on your phenolic or plastic folding cones (if you don't have my stainless steel folding cones), and the Rounding, Finishing, and Polishing Mandrel Set for ultra smooth and shiny coin ring edges to finish up your coin ring! This tool can be used to remove the coin ring "Lips"; or the lip that's located underneath the reeded side of the coin (if you choose to) for a more uniform look. You can also use this to remove the reeds on the coin's thicker edge if they're either damaged; or whether you just prefer that particular look. 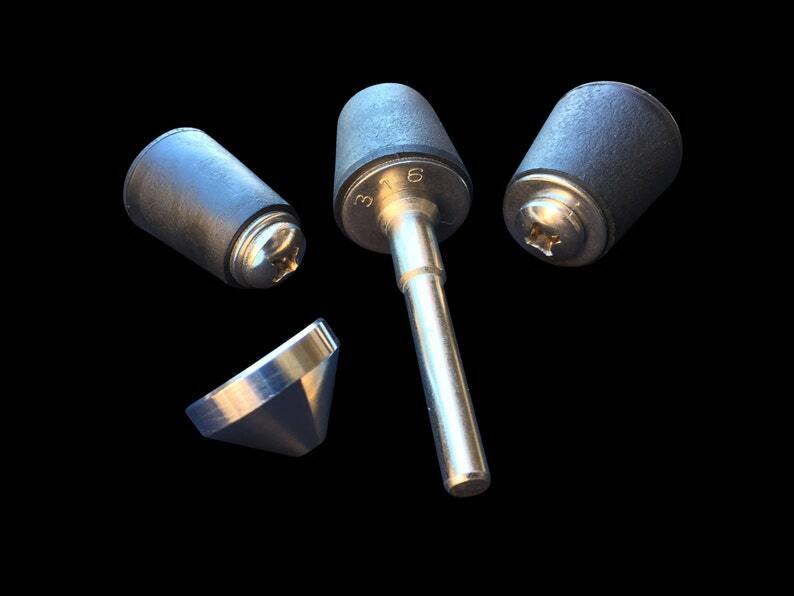 The abrasion-resistant rubber mandrels also naturally protects the coins' detail from damage while you're working it, so there's no need to use a screw to hold the coin in place, which could cause damage to the coins' surface... it's like having multiple tools-in-one! * Why spend less or the same amount for inferior dies and coin ring tools elsewhere? Buy from CoinRingUSA® and get the best in quality tooling! * "I can't believe I lived without these for so long. Many uses beside finishing rings. Thanks Martin." * "So you know how you make a cool coin ring then spend maybe an hour or so sanding it? (Depending on how high of a grade you want to go of course..) this awesome coin finishing kit whittles that time down to like 5-10 minutes. Simply amazing. Thanks again Martin for some BA tools!" * "Nice set to give that finished look to your rings." * "Fast shipping and well made kit. The starting cone will likely last forever and using it makes the first fold more self-assured, it minimizes wear on the synthetic cones and removes the worry about having to replace them. It's worth noting that it would be great if every company which offered products was like this one and they were constantly looking for ways to improve on and lengthen the life span of their products. As a business model, it would elevate creativity and quality above planned obsolescence. It would obviously be more profitable to make the tools inexpensively and let the ring makers use them until they wear out and then have to replace them. The tools bought here are not only designed to enable the making of professional level rings but to last as long as possible, saving the ring makers from repeat spending." * "Martin is fantastic with customer service before, during, and after the sale. I received this Finishing & Polishing mandrel set and I can't say enough good things about them. It has taken my work to a professional level and I don't know how I did without them. Thanks." 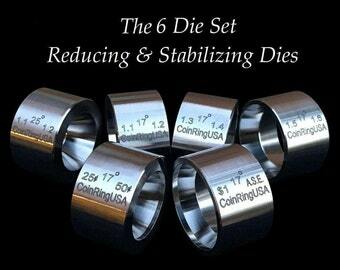 --- Ray S.
* "This is the best thing I have purchased in coin ring making. Thank you for such an amazing product!" --- Larry M.
* "This fills a niche not previously addressed, and is almost a necessity to produce a quality ring!" --- Dale C.
- Always wear safety glasses and work gloves. - Always use caution when working with any power tools and electricity. - Keep fingers, long hair, and loose clothing away from any fast moving parts. Please Note for International orders: If you are ordering from outside the United States, your package may be delayed at Customs, depending on your particular country's policies for inbound U.S. shipments. You will need to inquire with your local Post Office or Mail Carrier Service for further delivery information. Customers ordering from outside of the United States are responsible for any duties, import taxes and/or brokerage fees that your country might impose upon delivery. These charges are not included in the cost of shipping and handling of your order. UNIVERSAL Coin Ring Folding, Polishing and Finishing Kit! FULL COMBO SET! 5 Universal Reduction/Folding Dies (.7" - 1.6" inch @ 17-Degrees) and Stainless Steel Stabilizer Folding Cones! Thanks, needed this for sure! Simply an awesome product! I hope to build my toolkit to include every item CoinRingUSA sells! I accept PayPal and all major Credit cards and Debit cards. If you do not have a PayPal account, you can still make your payment through Paypal using your credit or debit card, or; you can pay through Etsy directly for your items. Returned items must be in their new condition. Buyer pays for return shipping, and a 10% restocking fee will apply. *** NOTE *** Please combine the saved items in your shopping cart BEFORE you check out in order to save on shipping costs. Processing time may vary between items ordered. My Shop ships worldwide! If you are ordering from outside of the United States, please be aware that your country may impose a VAT, (Value Added Tax); (also known as a Customs Duty), on the order. You will be asked to pay this additional fee before receiving your parcel. Please research your country's laws and any additional fees that may be placed on the items you'd like to order. Also be aware that your Customs may delay the package for an unknown period of time. You will need to inquire with your local Post Office or postal service for further delivery information. My Shop is not responsible for customs delays. Customs forms paperwork will be placed on the package to expedite the process. Thank you for your business! Reviews of the tools purchased are always appreciated. If you would like to place a custom order, please select the blue "Request Custom Order" tab on my Shop's Homepage, or send me a message through Etsy with your request. Slight non-functional variations of things such as color, texture, and engraving on items may occur from time to time. SAFETY FIRST! Always use safety glasses and keep hair and loose clothing away from pinch points and sources of heat while working.